Magic moments can last a lifetime but they can also provide the foundations for a successful small business. One might think that interviewing a professional magician is bound to result in just a few tricks of the trade being revealed. However, Auckland’s Mick Peck, is (understandably) tight-lipped about showing his hand, leaving plenty up his sleeve. In fact, the most amazing aspects of magic are those which are designed to be shared by only a lucky few. A true appreciation of the hard work and skill which goes into magic can only be attained by those within an intimate circle, a Magic Circle, to be exact. 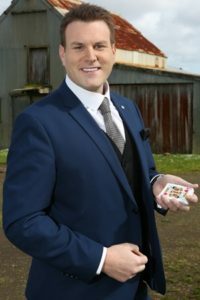 Since 2014, Mick – one of just a handful of fulltime, professional magicians who ply their trade in New Zealand – has been a member of the Magic Circle, an exclusive, London-based club for the world’s best. Despite reaching the top of his profession, even ‘magic Mick’ can blow a trick now and then. However, the show must always go on. He says younger children and adults are most likely to allow themselves to be amazed; older children can prove ‘tricky’. Although children were among the first to witness his antics, these days Mick primarily performs for adults during corporate events. Asked if he believes in magic, he is quick with an understandably diplomatic (if not philosophic) response: “People used to be amazed by medicine men shaking bones and that’s transformed into the comedian, the magician and people like that; it’s all entertainment, isn’t it? Oh, and you could add politicians to that too, in a way!” he smiles. Despite his reluctance to reveal any stage secrets, Mick is prepared to explain just how a trickster managed to make a go of show business. “My first magic show was as a student during a fundraiser at intermediate school. That was a trial by fire because they wanted a full 45-minute stage show. It was very ambitious for a first performance,” he recalls. By the time he was 15, Mick was already a semi-professional, performing at birthday parties before tackling magic full-time. In 2014, he became a member of the Magic Circle. Few are invited to join – and no, the invitations are not couriered by owls, he confirms! – and any who give away secrets are liable to be unceremoniously ‘cast’ out. “In the backs of all the magic books I used to read growing up, there were listings of new members, so the Magic Circle was a bit like Hogwarts for me. It was a real honour to be able to join,” says Mick. Mick is also a member of the Auckland Brotherhood of Magicians, which has helped Kiwi professionals hone their craft since 1945. And, late last year he received the prestigious NZ Variety Entertainer of the Year award.